that my fifth son was born perfectly healthy and beautiful. 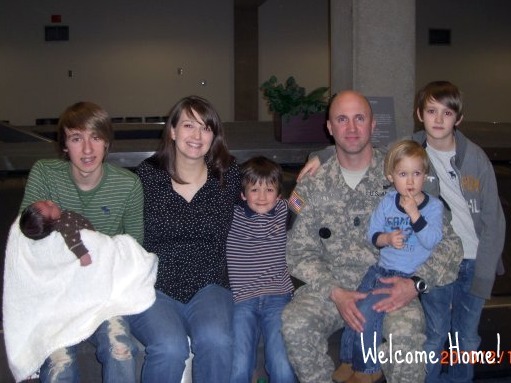 that my husband returned home safely from Afghanistan four days later. for Papa Bear, who is a diligent and hard-working provider and protector for our family, who is proud to serve his community and his country, and who balances me out. for M1, who is growing into a confident, capable young man way too fast. for NG, who is nurturing, creative, and a good judge of character. for IB, who is friendly, funny, and adventurous. for LJ, who is tender, protective, and adorable. for M2, who is cuddly, sweet-tempered, and determined. that I still have my mother here on earth to love and spoil my sons (no matter how much I complain about it). for a stepfather who loves my mom and all of us as his own and is thoughtful and generous to everyone he meets. that we were able to pay off almost all of our debt and still have a down payment for a new house. for our new home, with room for all of us and family and friends too. for access to clean water and a bounty of healthful foods. for our health and God's provision. for selfless people who put their own lives at risk to protect others: soldiers, law enforcement, firefighters, and emergency responders. that I live in a country where I am free to worship my Lord and Savior, Jesus Christ, and teach my own children as I see fit. Linked to 5 Minutes for Mom. I am being thankful alongside you. We have a healthy new 9 week old...who looks like she's already 3 months old. Military hubby who thankfully hasn't had to deploy in two years...and my two precious babies (3 and 7)..along with my older step daughters...thank you Jesus for them all. AND thank you for your great blog! Thanks, Brook! I hope you had a peaceful Thanksgiving holiday with your family.